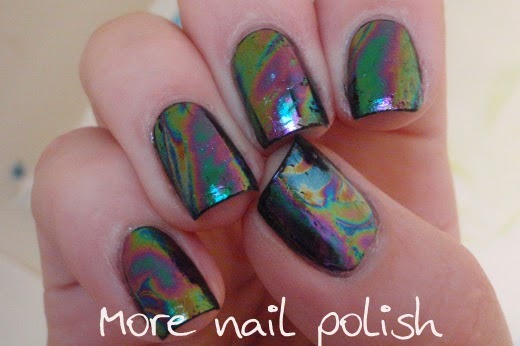 I've heard many a girl say that she would love to have a polish that looks like an oil slick on her nails. Today's mani started as just that, but then I went and ruined it. Stay tuned to see that train wreck. 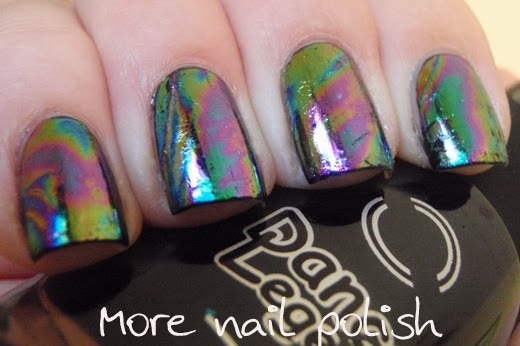 But to start with, here is the gorgeous oil slick effect. 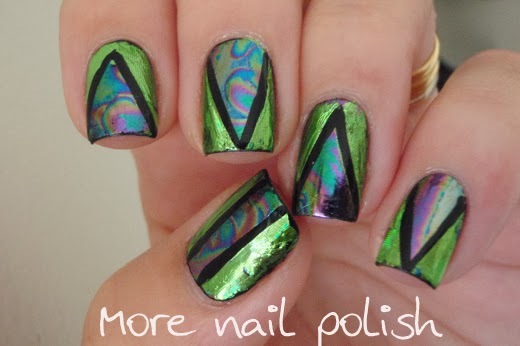 I achieved this by using some very pale and transparent looking nail foils over black polish. I used Dance Legend Nox for my black base, which is from the Lumos collection and it's a fantastic one coater. The nail foils really came to life when I put them over black. They really do look like a wet oil slick. The other thing you might notice here is is is my right hand. Damn it it's hand to get my right hand looking all relaxed and natural for photos, I always feel so awkward getting it to hold a bottle, let alone my trying to take the photos with my left hand with the shutter button is on the wrong side. Anyway, my awkwardness aside, doesn't this look amazing. The reason you see my right hand is because I did these nails at night, and as I was half way through doing them, I realized what a dreadful FAIL I had created on my left hand, so I kept my right hand plain with just the foil on it. Sometimes I need to learn to just leave things good and well alone!! What what mess did I make? 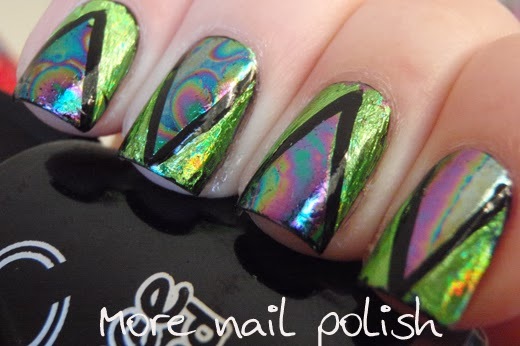 I added more foil (holographic lime green in fact) and thick black lines. Good God what was I thinking? There is definitely something alien looking about these nails. Aren't you glad I share my fails too :) So now, forget these ugly things, and scroll back up and look at the pretty foils on my right hand. Oh wow, it really does look like oil! How awesome! Well, I must say, I don't think it's bad. Actually, I do like it. I see no fail there. I love it! 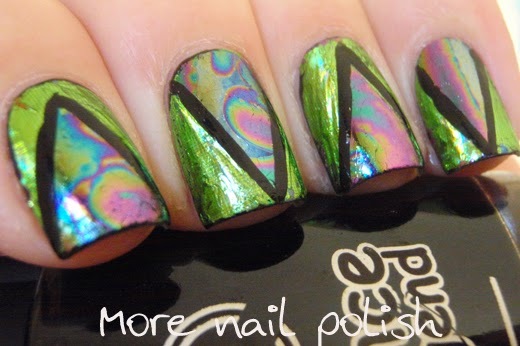 WHERE CAN WE GET THOSE FOILS? SO COOL! 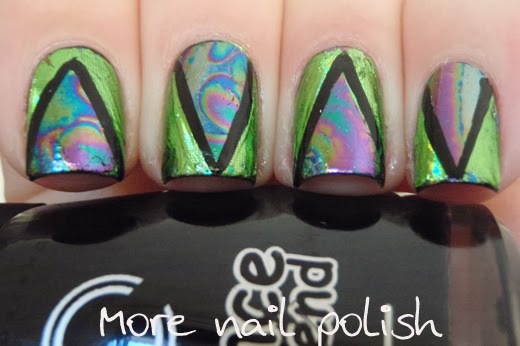 I love the oil slick effect, but I also love the acid green foil you added in the end! It was your 'fail' that brought me here from a random search for something. I think its lovely - not a fail at all!